It's been quite sometime ( i say ashamed, head looking twords the ground ) since I've done a portrait from life. 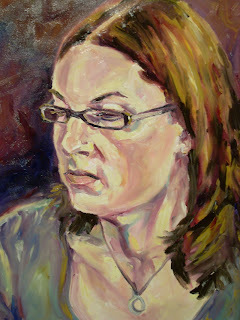 I was lucky indeed when my lovely friend Kelly allowed me to paint her. This piece was done in about 2 and a half hours, measuring 16x20. I find I approach the painting much differently then I do when working from a photo ( yes still ashamed here ), and can't wait to work on many more portraits like this in the future.